Clips of Becky Lynch winning this year’s Royal Rumble and choosing to face Ronda Rousey (from last night’s RAW). Becky Lynch heads to the ring. She says a lot of things have happened in the last few days. She also says she couldn’t wait until tonight to tell Ronda Rousey that she was going to choose her. She wanted to tell that to Ronda face to face on RAW. Becky also responds to Rousey’s comments from last night. Lynch is proud of coming up from nothing, and she’s proud of working her way up from the Wrestlemania pre-show to the main event in one year. Charlotte Flair heads to the ring. She congratulates Lynch for making it off the kickoff show. Charlotte is proud of Becky for willing her way into the Rumble and winning. Maybe Lynch actually did learn something from Charlotte. Charlotte takes credit for Lynch’s success and fan support. Lynch punches Charlotte in the face. Lynch walks away, but Charlotte chases after her. Charlotte attacks, and the two women brawl down to ringside. Officials and referees separate them, and Lynch smirks as she slowly walks up the ramp. Shinsuke Nakamura admires the US Title. R-Truth and Carmella head to the ring. R-Truth is still upset about getting replaced in the Royal Rumble by Nia Jax. R-Truth says he would have won the Rumble, and he’s been granted a US Title match for missing out on his opportunity. Most of this match took place during a commercial break and the finish was strange because of the referee’s call, but this was fine. It was certainly surprising. After the match, Rusev and Lana head to the ring. Rusev says this isn’t right. Rusev took the title from Nakamura because the title deserves better, and it certainly deserves better than R-Truth. Rusev suggests that he and R-Truth have a title match right now. Everyone argues, and Carmella shoves Lana to the mat. Rusev and R-Truth then get into a shoving match until R-Truth agrees to put his title on the line. This was quite short, but it was also quite a surprise. After the match, Nakamura runs down the ramp and attacks R-Truth. Nakamura rolls R-Truth into the ring where Nakamura and Rusev both attack him. Nakamura holds R-Truth for a Machka Kick from Rusev. Then Rusev holds R-Truth for a Kinshasa from Nakamura. Kayla Braxton asks Becky Lynch why she refused to let the medical staff look at her. Becky says she doesn’t need to spend any more time on the shelf. Then she drives away from the venue. R-Truth is attended to, but he says he’s fine. He doesn’t look fine. Rey Mysterio heads to the ring for a match with Samoa Joe. Zelina Vega comes out after Rey gets to the ring. She knows Rey is the person who got her barred from ringside last week. she speaks, Andrade attacks Rey from behind. Andrade hits Rey with two-thirds of the Three Amigos, but Rey blocks the third suplex. Andrade is set up for the 619, but Andrade blocks it. Andrade hits Rey with a hammerlock DDT to end the brawl. Karl Anderson and Luke Gallows ask Rusev why he attacked R-Truth two on one. Rusev tells Anderson and Gallows to mind their own business. Anderson says Rusev and Nakamura wouldn’t stand a chance against the Good Brothers. Nakamura walks up and accepts the challenge. Rusev doesn’t look happy, but he says he will team with Rusev just this once. Shane McMahon tells The Miz that he is going to love tonight’s celebration. Paige and The Rock attend the Sundance premiere of Fighting With My Family. Shane McMahon and The Miz head to the ring. Shane has prepared something memorable for The Miz. He shows a video of the formation of their team and of them winning the SmackDown tag titles. Shane follows up the video by bringing out The Miz’s dad George. In the ring, The Miz’s dad tells The Miz that he’s proud of him. Everybody hugs. Shane then wonders who will be the next challengers for the tag titles. He’s decided to have a number one contender match which starts right now. Kayla Braxton welcomes Sonya Deville and Mandy Rose. Rose and Deville officially enters themselves into the Elimination Chamber Women’s Tag Title match. Rose also says it’s not easy being her. People like Naomi are always trying to knock her down. Rose shows footage from Tough Enough 2015 when Naomi didn’t believe in Rose and called her weak. Sonya says Rose hasn’t been the same since that day. Rose says she went home that night and cried until she developed a complex which destroyed her then-current relationship. But for now, Rose’s mind is on becoming the first tag champs with Deville. Very good match. Heavy Machinery had a strong spotlight put on them. They dominated large potions of the match, but the other three teams picked their spots in a much smarter way. The match went on for a good long while, and every team looked good. I liked that it took a while before the eliminations started happening, and I liked the fast pace of the last few minutes. Daniel Bryan slaps food out of someone’s hand. 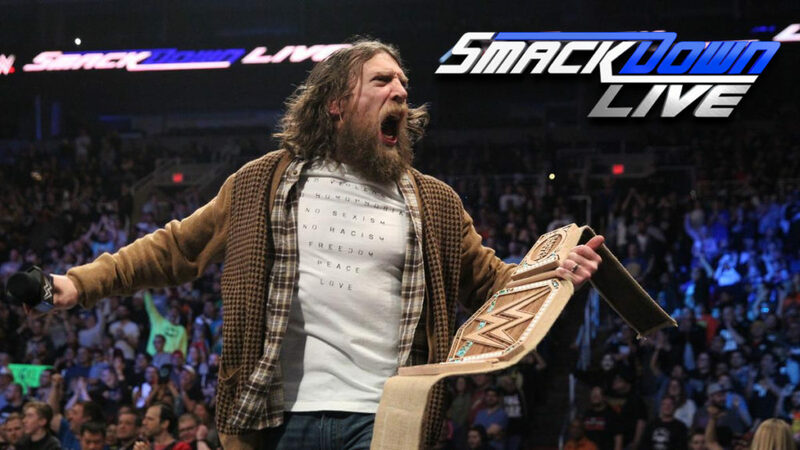 Daniel Bryan heads to the ring. Bryan asks the crowd if they know who won at the Royal Rumble. The crowd says that Becky won. Daniel Bryan disagrees. Everyone won because Daniel Bryan, the planet’s champion, won. Bryan doesn’t expect everyone to understand what he’s saying, but there is one man who understands. He is a man who came to Daniel Bryan’s aid for the greater good. That man’s name is Rowan. Rowan heads to the ring. Bryan says Rowan’s hands are dirty because he is an intellectual man of the earth. He is able to see through the facade of AJ Styles. Even someone as ignorant as Styles is right sometimes though. Styles implied that Bryan is a hypocrite, and Bryan says that he is. Bryan says he is a hypocrite because he carries around the WWE Title. Rowan brings a trash can into the ring. Bryan says the title belt is a symbol of excellence, but it is also a symbol of excess. It is made by cheap labor, and it’s base is made from the skin of a dead cow. That cow, Daisy, was capable of experiencing joy and pain. Daisy gave her life for that symbol, the symbol that Bryan and Rowan stand against. Bryan throws the title belt into the trash can. Bryan then unveils a new title belt. It’s a title made out of wood and hemp. It is the new WWE Championship. As Bryan explains the new title, AJ Styles comes out to the stage. Styles wonders if Bryan smoked the prototype to the new title. As Styles heads down the ramp, Randy Orton comes out and heads to the ring. After a commercial break, Bryan, Rowan, Styles, and Orton have been joined by Jeff Hardy. Mustafa Ali also heads to the ring. Ali is interrupted twice when Samoa Joe heads to the ring. Joe talks down to everyone as Bryan and Rowan quietly exit the ring. A brawl breaks out, and Daniel Bryan screams that no one in the ring is getting an opportunity at his title. Triple H appears on the tron. He says that Bryan will not face any one of the people in the ring, he will be facing all of them inside of the Elimination Chamber. The brawl continues as the show ends. I enjoyed this show. There wasn’t a lot of wrestling, but the tag match was really good and the title matches were fun and interesting. The talking, though there was a lot of it, was mostly good. I could have done without the Miz/Shane thing, but I’m just not into that story line at all.